BeenThere-DoneThat: Black Mountains, Brecknockshire, Wales. A view across the Wye Valley from below Hay Bluff. The white blobs on the hillside are of course the inevitable sheep. I would be surprised if anyone could travel to Wales and not see some sheep. 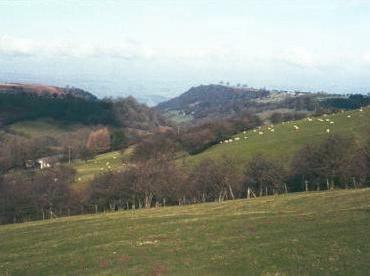 This view is from below Gospel Pass looking North West out over the Wye Valley. 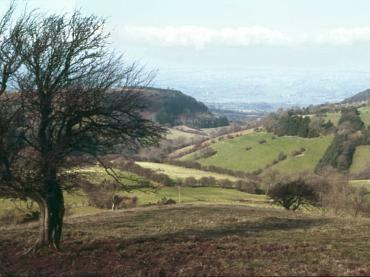 A small road goes through the Gospel pass and leads into the Vale of Ewyas to the South-East. 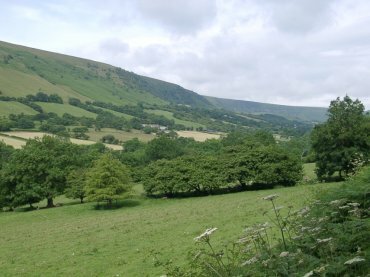 Looking North along the valley from near Llanthony, towards Capel-y-Ffin and the 1800 feet high Gospel Pass. The River Honddu flows through this valley but a word of caution if you look for this river on a map. 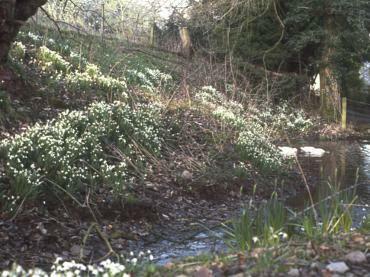 There is another River Honddu which flows through Brecon from the north to join the River Usk. Don't confuse the two! These were in a small village called Llanigon, about two miles South-West of Hay-on-Wye, in mid February.